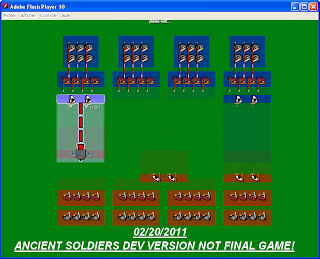 Roguedjack Flash: "RoughBall" and "Ancient Soldiers"
I inserted a subtle "not final version!" text in the screens just to remind you guys the games will likely evolve in all aspects, gameplay and appearance. ROUGHBALL : Turn based, sport. A simplified BloodBowl with some twists. I use a system of dolls for the characters appearance, like I do in Rogue Survivor. I like the silly faces the characters have. 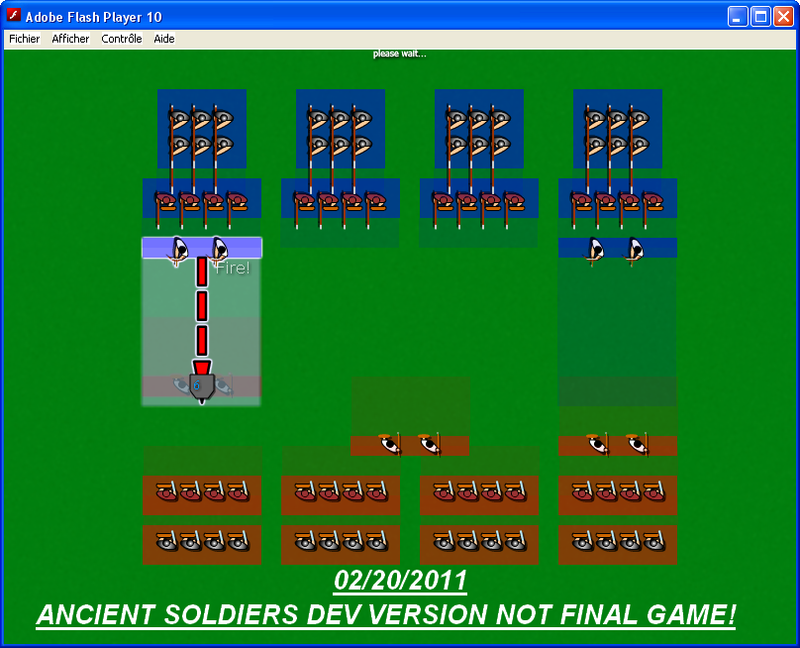 "I haz teh ball dis makes me big grin :D"
ANCIENT SOLDIERS : Turn based, strategy. A miniature-based wargame with some original ideas on command and control and army design. There are too much of them. Yeah, I agree that flash games are not that fun and while not "stupid", definitely not "clever" :). Also I agree that the main problem is their simplicity, they are fun for a one playthrough, but I've yet to see a single flash game which I want to play twice... While it probably took a lot of time for the game maker to make it, so IMHO it's an unfair business, because I feel like I make single-use plates when I do it. Good luck to you and I wish you to be able to make a multi-use game which will attract users and keep them playing it multiple times :). Flash games are usually casual games with limited (or non-existant) replay value. 3) most devs are inexperienced and starting game development in Flash. At least that's the impression I've got, I might be wrong though. Also the fact that they usually are not really good at saving your proggress (at least many of them), so you cannot play a complex game for a long time... It became a trend to make them for a single playthrough. Still it's possible to make a multi-mission strategy or RPG, so it's just a problem of the general development direction. Ah you're right, I forgot about saving games. How does Flash handles persistant data? Does it work more like cookies or serialization? I haven't look into that yet. Some games save your progress so I suppose its no big deal. The best idea is to save the data on the server and use accounts. This way a random browser cleanup won't kill all your saves.